KEXP is known internationally for their music and authenticity. To help bring their global audience the music they want, KEXP needed to find a solution that could bring all of their services online. While they eventually accomplished their goal, they did run into roadblocks along the way. Your partners at PC PORTAL and Microsoft can help you overcome any obstacle. With years of industry experience, you can be rest assured knowing your custom IT solution will be up and running in no time. Contact us today to find out more on how we can help. We round up interesting research and reporting about security and privacy from around the web. This month: healthy GDPR, gender rebalance, cookie walls crumble, telecom threats and incident response par excellence. Ireland’s Department of Health is now considering amendments to the Health Research Regulations, with data protection as one of the areas under review. The Health Research Consent Declaration Committee, which was formed as part of the Health Research Regulations made under GDPR, confirmed the possible amendments in a statement on its website. GDPR triggered significant changes to health research because of the obligations on data protection impact assessments. Our senior data protection consultant Tracy Elliott has blogged about this issue. The newly announced engagement process may lead to changes to the Health Research Regulations “where any such amendments are sound from a policy perspective and legally feasible”, the HRCDC said. There’s a link to a more detailed statement on the proposed amendments at this link. Women now make up almost a quarter of information security workers, according to new figures from ISC(2). For years, female participation in security roles hovered around the 10-11 per cent mark. The industry training and certification group’s latest statistics show that figure is much higher than was generally thought. Some of this increase is due to the group widening its parameters beyond pure cybersecurity roles. The full report shows that higher percentages of women security professionals are attaining senior roles. This includes chief technology officer (7 per cent of women vs. 2 per cent of men), vice president of IT (9 per cent vs. 5 per cent), IT director (18 per cent vs. 14 per cent) and C-level or executive (28 per cent vs. 19 per cent). “While men continue to outnumber women in cybersecurity and pay disparity still exists, women in the field are buoyed by higher levels of education and certifications, and are finding their way to leadership positions in higher numbers,” ISC(2) said. The trends are encouraging for any girls or women who are considering entering the profession; as the saying goes, if you can see it, you can be it. (The report’s subtitle is ‘young, educated and ready to take charge’.) After the report was released, Kelly Jackson Higgins at Dark Reading tweeted a link to her story from last year about good practice for recruiting and retaining women in security. You know those annoying website pop-ups that ask you to accept cookies before reading further? They’re known as cookie walls or tracker walls, and the Dutch data protection authority has declared that they violate the General Data Protection Regulation. If visitors can’t access a website without first agreeing to be tracked, they are being forced to share their data. The argument is that this goes against the principle of consent, since the user has no choice but to agree if they want to access the site. Individual DPAs have taken different interpretations on GDPR matters. SC Magazine quoted Omar Tene of the International Association of Privacy Professionals, who described the Dutch approach as “restrictive”. This might be a case of GDPR solving a problem of its own making: The Register notes that cookie consent notices showed a massive jump last year, from 16 per cent in January to 62.1 per cent by June. Is your organisation’s phone system in your threat model? New research from Europol’s European Cybercrime Centre and Trend Micro lifts the lid on network-based telecom fraud and infrastructure attacks. The Cyber-Telecom Crime Report includes case studies of unusual attacks to show how they work in the real world. By accessing customers’ or carriers’ accounts, criminals have a low-risk alternative to traditional forms of financial fraud. Among the favoured tactics are vishing, which is a voice scam designed to trick people into revealing personal or financial information over the phone. ‘Missed call’ scams, also known as Wangiri, involve calling a number once; when the recipient calls back, thinking it’s a genuine call, they connect to a premium rate number. The report includes the eye-watering estimate that criminals make €29 billion per year from telecom fraud. Trend Micro’s blog takes a fresh angle on the report findings, focusing on the risks to IoT deployments and to the arrival of 5G technology. The 57-page report is free to download from this link. Europol has also launched a public awareness page about the problem. Norsk Hydro, one of the world’s largest aluminium producers, unexpectedly became a security cause célèbre following a “severe” ransomware infection. After the LockerGoga variant encrypted data on the company’s facilities in the US and Europe, the company shut its global network, switched to manual operations at some of its plants, and stopped production in others. Within a week, most of the company’s operations were back running at capacity. Norsk Hydro has released a video showing how it was able to recover. Other victims weren’t so lucky. F-Secure has a good analysis of the ransomware that did the damage, as does security researcher Kevin Beaumont. The post Security roundup: April 2019 appeared first on BH Consulting. This spring, many of us will roll up our sleeves and get down to business decluttering our homes. Garage sales will be held, basement storage rooms will be re-organized, and donations will be made. Shouldn’t the same thing happen in our digital lives? After all, the average American will spend the bulk of their waking hours parked in front of some sort of screen—flipping , swiping, and clicking away. A little tidying up of data and online habits can go a long way toward enhancing your digital security andpeace of mind. So here are a few tips for tidying up your tech designed to make you ask not only: “Does this bring me joy?” but also, “does this make me more secure?” If not, consider purging apps, connections, and permissions that could leave you more susceptible to a breach. If you answer yes, make sure you’re taking the necessary steps to protect it. Since the Blueborne family of vulnerabilities was discovered in 2017, deactivating Bluetooth when not in use has become standard security advice. With the increasing adoption of home IoT devices, the consequences of ignoring that advice have only risen. Bluetooth connections are like a lonely person on a dating site; they’re in constant search of a connection. When Bluetooth-enabled devices seek out the wrong sources—that of a cybercriminal, say—they are vulnerable to exploitation. Shrouding your connection in a virtual private network (VPN) is especially important when accessing public or unsecured WiFi networks. Again, we make a trade-off between convenience and security when logging on to these “free” networks. Without additional protection, cybercriminals can spy on these unencrypted connections either by commandeering the router or by creating their own spoof of a legitimate WiFi hotspot, in a variation of a man-in-the-middle attack. From here, they’re free to monitor the data flowing between your device and the network. A VPN encrypts the traffic between your device and the router, ensuring your digital footprint is shielded from prying eyes. While some apps are inherently sketchy, and users shouldn’t expect the app creators behind them to prioritize security, others introduce vulnerabilities inadvertently. When responsibly run, app developers address these security gaps through software updates. Take the cultural phenomenon Fortnite, for example. The game that drove its parent company, Epic Games, to an $8 billion valuation was found at the beginning of the year to contain multiple vulnerabilities that would have allowed malicious actors to take over player accounts, make in-game purchases, and join conversations. Epic Games was quick to issue “a responsibly deployed” fix, but in this and similar instances, users are only protected after installing the suggested updates. For more tips on protecting your smartphone from mobile malware, see our complete list of recommendations here. Purging unused apps is a good principle for spring cybersecurity cleaning – like a box of old clothes you haven’t worn in decades, unused apps represent digital data containers you no longer need. But what about all that data you’d hate to lose—the pictures, videos, documents, and other files you’d be devastated to see disappear? Protecting that trove of data is another core tenant for tidying up your tech. Ransomware is one prime reason for keeping up-to-date backups of valuable data. It can strike anyone from college students to cities, and the list of those who’ve been burned is long and distinguished. Natural disasters and device theft—two contingencies even the tightest cybersecurity can’t account for—are prime reasons to make sure backups are in place sooner, rather than later. Cloud backup is more secure and affordable than ever, so it makes sense to back up anything you couldn’t stand to lose, before it’s too late. Want more tips for cybersecurity spring cleaning? Download Webroot’s full checklist for tidying up your tech. The post Four Tips to Help Tidy Up Your Tech appeared first on Webroot Blog. The post Cyber News Rundown: Massive Data Breach at Georgia Tech appeared first on Webroot Blog. Although phishing has been around in various forms since the 1980s, our research shows it continues to evolve—and remains a major threat. These days, phishing tactics have gotten so sophisticated, it can be difficult to spot a scam—particularly in the case of hijacked email reply chains. Let’s look at a concrete example. 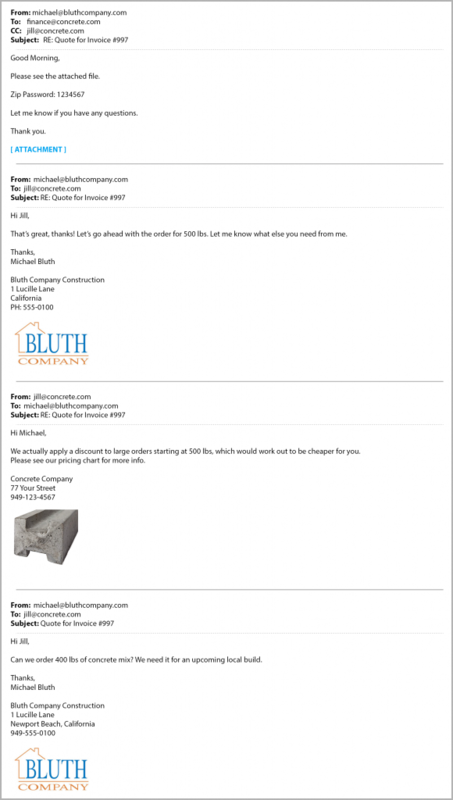 Imagine you’re a purchaser for a concrete supplier, and you get an email from a regular client about an order. In that email, you can see this client, Michael, has been exchanging messages with your colleague, Jill. The email addresses, corporate logos, and everything about the email chain look 100% legitimate. You’ve even met Michael in person, so you know he’s trustworthy. In this case, the conversation details are convincing to you—because they’re real. Someone gained access to your colleague’s email and took over a legitimate conversation about purchases, then forwarded it to you with a malicious payload attached. A message like this is very likely to get through any email filtering, and you’d probably open it, since it looks like it’s from a trusted sender. Had you opened the file in this hypothetical scenario, you might have gotten infected with Emotet or another banking Trojan, such as Ursnif / Gozi. This image is an example of a malicious word document asking you to “enable macros.” This is a common malware tactic that convinces a victim to disable their own security. The difference between an ordinary phishing attack and a hijacked email chain really comes down to believability. The criminals behind these campaigns take their time breaking into email accounts, watching business conversations, negotiations, and transactions, then launching their attempts at plausible moments when the recipient’s guard is most likely to be down. Most commonly, these attacks have been attributed to Ursnif/Gozi campaigns. Webroot has seen quite a few cases of these hijacked emails with the same style of phishing text and nearly identical payloads. There are numerous reports online as well. In a malware campaign like this one, it really doesn’t matter whose account the malicious actors have broken into. If you receive an email from your project manager, a sales colleague, the finance department, a particular client, or anyone else that bears the markers of a legitimate, ongoing email conversation, the attack is highly likely to succeed. Seen since last November: all email bodies had a long list of replies, but all had the following message. This would suggest they are all samples that can be attributed to the same gang. Each had .zip files attached with convincing names related to the business at hand, which contained Microsoft® Word documents with filenames that started with “request”. Faced with such plausible attacks, it might seem impossible to stay safe. But there are a few tips that can keep you protected. First, never turn macros on, and never trust a document that asks you to turn macros on, especially if it’s a Microsoft® Office file that wants you to show hidden content. Macros are a very common attack vector. Second, always make sure to keep your operating system up to date, especially Microsoft Office programs. Third, you likely already mistrust emails from people you don’t know. Now, it’s time to turn that suspicion onto trusted senders too. Attackers commonly try to spoof email addresses to look like those you’re familiar with, and may even gain control of an email account belonging to a person you know. Always err on the side of caution when it comes to emails asking you to download attachments. Fourth, it’s important to protect your own email account from being hijacked. Attackers can use techniques like alternate inboxing to send messages from your account without your knowledge. Be sure to secure your account with strong passwords, 2-factor authentication, or use a secure password manager. Encourage friends and colleagues to do the same.Finally, if you’re suspicious of an email, the best way to check its legitimacy is to pick up the phone. If you know the sender personally, ask them about the message in person or via phone. Or, if you receive a message from a company, look up their publicly listed phone number (do not use the number provided in the email) and call them. For businesses and managed service providers, our portfolio of integrated, next-generation security includes Endpoint Protection, DNS Protection, and Security Awareness Training for end users. The post Hijacked Email Reply Chains appeared first on Webroot Blog.